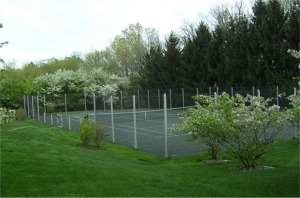 We provide complete “turn-key” solutions to constructing the tennis court of your dreams. And our capabilities reach out to other types of courts including Basketball, Bocce, playgrounds, and multi-use courts. Our clients benefit from having a single point of contact during the construction phase. Top-A-Court will ensure proper coordination of activities. With more than twenty years experience and expertise in sports court construction, we confidently offer our customers the longest warranty in the Tri-states area. Top-A-Court Tennis can provide free initial consultation to assist you with the design of your tennis court. 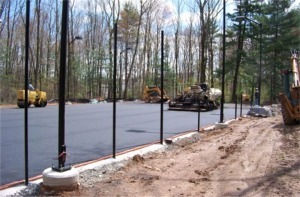 We work within your budgetary constraints while providing you with the current "best practices" for Tennis Court Construction as determined by the American Sports Builders Association. The most common form of construction for more than 60 years is the asphalt court. The material is readily available, recyclable and cost effective. The process of construction includes site analysis, excavating the site to create a level area, filling in the site with an appropriate depth and grade(s) of stone to form a stable base. This process is then followed by a base course of asphalt, followed by an additional course of finer asphalt known as a weaning course. Once the asphalt is in place, it will then need to cure for between 14 and 21 days prior to color finishing and the application of playing lines. This court type provides true bounce, and resilient footing which encourage longer rallies while delaying fatigue. The porosity of this material allows for fast drainage and a quicker return to play following a rainfall. Studies indicate that fast dry surfaces reduce the potential of injury. Players of all skill levels, age and experience are able to benefit. 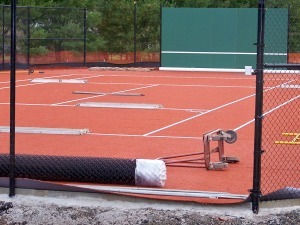 Fast Dry courts include Har-Tru material and other synthetic materials that have displaced the traditional clay court. These materials are available as sub-irrigated courts. Sub-irrigation optimizes surface moisture levels, and uses 1/3 less water versus above ground irrigation methods. Synthetic turf courts are an area of growing popularity. Synthetic turf holds up well under heavy use and hot and dry weather conditions in comparison to grass, while providing the experience of play you would expect on a grass court. Artificial grass is compliant and allows a slight sliding action that is similar to a clay court. Very little maintenance and few repairs are required. Synthetic turf is typically built on an asphalt base, drainage is provided and the turf is then laid and filled. Synthetic turf is available in a number of traditional tennis colors.